This was actually the second time we tried to record this episode, but technical woes mean we forced to postpone! It's OK though, because we were able to make it work and we covered lots of great animation topics! Chris, Rachael, Dan and Yvonne get into some of the latest animation news including the Phoenix Wright anime and the latest developments in Hayao Miyazaki's forthcoming Boro The Caterpillar. 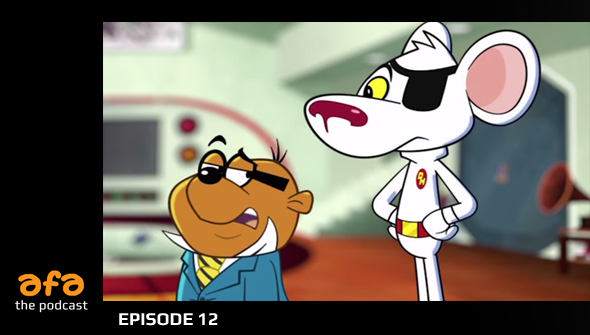 Then we get into some of the great animated TV that's been airing lately, including the start of the new Danger Mouse, South Park and Steven Universe. We also finally have a proper excuse to talk about the Muppets! Sadly Rach and Yvonne had to make early exits, but Chris and Dan stuck around to talk about the new trailers for Peanuts, The Good Dinosaur and Angry Birds. Subscribe on iTunes Here. Or find us on Stitcher. If you enjoy the show, please leave us a review on iTunes or Podcasts.com and help spread the word. And we're always happy to get your emails or questions to feature on the show! If you'd like to advertise or sponsor a show please contact us. If you enjoy the show, please leave us a review on iTunes or Podcasts.com and help spread the word.